In many of our product descriptions, particularly in those sold under the Xodus brand, we reference something called “Low Glow Technology.” The descriptions imply that Low Glow has something to do with getting a small amount of light for a very long time, but what is it really? 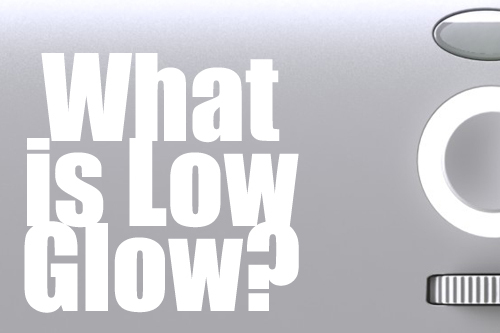 It’s our goal to make sure you always know exactly what you’re getting from us, so here’s how Low Glow was developed, and how it works. One of the benefits of Jenesis’ small business status is the opportunity to tinker with new ideas. We have both the freedom and the time to experiment with ideas that none of the big consumer electronics companies have considered. Most LED lighting companies focus on finding ways to drive more and more power through their LEDs to get brighter and brighter light output. However, this inevitably leads to products that either require a plug or consume batteries at an alarming rate. Jenesis Senior Engineer Roger Bentley, on the other hand, wondered how low he could run the current and still get a usable amount of light from the LED fixture. He began experimenting with a number of off-the-shelf LED products, and he discovered that one of the products was actually always on at a low level. To his amazement, he found that even at extremely low current, well below the rated specifications of the LED, it would still generate a remarkable amount of light. However, with nothing for it to illuminate, the low output was almost unnoticeable. To make more of the light available to the eye Roger coupled the circuit with a diffusing lens that picked up the light that was produced and scattered it across a wider surface. With the diffuser the LED could glow at a level similar to the dashboard lights in your car, while consuming very little power. The effect was particularly striking in dark environments where the eye was already adjusted for the low light. Roger began crunching the numbers, and discovered to his surprise that, with the right set of batteries, the circuit could glow for a year or more before the batteries would need replacement. Roger shared his discovery with the rest of the team, and they quickly realized that no one else in the LED lighting industry had hit on this idea. Jenesis patented the unique combination of low-power LED circuit and diffusing lens under the name Low Glow, and everyone began searching for applications where this novel product feature might be useful. It would have to be used in an environment where the light was fairly dim in order for it to be noticeable, and it would be the diffuser lens itself that would be most conspicuous in the dark. And while it might not provide enough light to read by, but it could help you find the switch for your reading lamp. Out of this discussion, four products emerged as prime candidates, each with a battery life of a year or more thanks to the efficiency of the Low Glow design. Mini LED Guide Light: The Mini LED Guide Light is perhaps the purest use of Low Glow; a coin cell battery, a light sensor, an LED, and a diffusing lens in the smallest possible package. The guide light functions as an automatic stick up light that lets you find or avoid things in the dark. Tired of fumbling for the light switch when you get home at night, or sick of missing that last step going down the stairs in the dark? Marking these locations with one of our guide lights will make them easy to spot. Deck Marker Light: The Deck Marker Light is essentially a scaled up LED Guide Light. Larger, brighter, and weatherized for use outdoors, the deck light can mark the location of steps or posts, highlight the edges of doors or paths, or provide an attractive touch of light to otherwise dark areas around the outside of your home. Glowing Key Fob: Everyone has experienced the frustration of dropping keys in a dark parking lot or scrambling for them in the bottom of a bag and being forced to find them by touch. The Glowing Key Fob adds a Low Glow light to your key ring, ensuring that your keys will always be visible, no matter how dark your surroundings. The glow fob also demonstrates the versatility of the Low Glow circuit. Simply press the button on the fob and it switches from a Low Glow light to a standard keychain flashlight. In-Cabinet Light: The In-Cabinet Light incorporates Low Glow as a useful additional feature rather than part of its primary purpose. The cabinet light’s on/off switch is surrounded by a Low Glow ring that makes the button easy to find in the dark when the cabinet light is in manual mode or if the ambient light level is too low for the sensor to turn on automatically. One might think that the low glow ring is an extra drain on the batteries, shortening the useful life of the product. In reality the battery life of the Low Glow ring is longer than the shelf life of the cabinet light’s four C batteries, in essence making the Low Glow feature a “freebie” on the product.